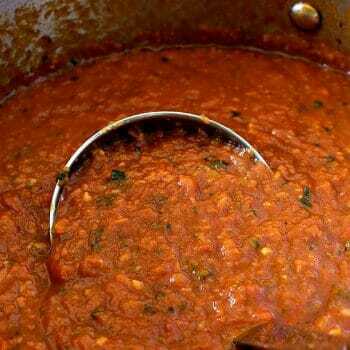 Place olive oil, onions and garlic in a cool sauce pan and gradually bring up heat to medium high. (Heating it this way makes the onions very soft.) Once the oil is hot and the onions and garlic are bubbling, cook for 3 minutes stirring frequently. Add all of the other ingredients. Stir and cook over medium-low heat for 15 minutes. Use as a dipping sauce or over pasta.